The widow of the title is Jean Taylor. Her husband died after being hit by a bus. This should be tragic but there are a lot of people happy about this event. Possibly even Jean herself. I don't want to give too much away, since I think going into The Widow without knowing anything makes a better reading experience. I knew almost nothing about it, and honestly if I had known more about the plot, I might not have given it a chance. Just know that the Taylors were involved in the investigation of a terrible crime. The book has several narrators. The Detective and The Reporter want Jean to talk, to tell them the things they suspect she knows. Jean is the only first person narrative the reader gets, she still keeps much hidden from us, and from herself. Once Jean's husband dies, she is free to tell her story, but will she? Whenever PR claims a book similar to Gone Girl, I want to shout NO! The Widow is pitched as thus and it is not. It's still twisty and people have secrets. There's a married couple, yes, but they are not Amy and Nick. Jean is a perfect complex character. I have conflicting feelings about her. Her husband is manipulative and controlling. Jean reads as someone both very young and naive, and decades older than her thirty-something years. At times, the things she did reminded me of things women my mother's age would do (my mom's almost seventy). Jean ends up being in a place where she is completely isolated from anyone who could help her. In her mind, the police and the press are her enemies. It's hard to imagine the loneliness she must feel. The media come off horribly in The Widow. If the Taylors haven't done anything wrong, the media has ruined their lives. This is something I always thought about during the Jonbennet Ramsay frenzy. 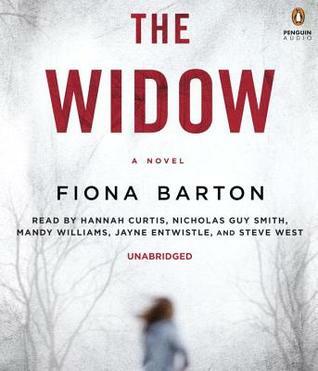 The Widow isn't just a straight up thriller. It is a look at the psychology behind the loyalties of the partners of people accused of terrible crimes and the things they tell themselves to stick by them. Although the book doesn't get into graphic details, there is pedophilia in the plot. I might not have picked this up knowing that. It did make me uncomfortable, but I was so interested that I never thought of abandoning the book. Just an FYI. About the Audio: The main narrators are Hannah Curtis, Nicholas Guy Smith, and Mandy Williams, with small parts by Jayne Entwistle (The Mother) and Steve West (The Husband). I can't complain about any of them. This was the first time I used the Volumes app. It is much easier to use than my usual way of downloading files to an old Sony mp3 player. Not all of my audio ARCs have this as an option though. It's so hard writing a review of a thriller or mystery when you don't want to spoil it for anyone! But, well done. Your review reminds me of a British miniseries called "The Guilty". Familial strain, confused media, well-meaning cops, etc. It's certainly an interesting genre to explore. Wow, that sounds really good! Yes, the media often convicts people before they even come to trial. Super glad you warned me about the pedophilia! It won't keep me from reading it, but I'm glad to have the advance notice. I looooove books that come at a story from multiple perspectives. This sounds good! I will have to check it out at some point.